Random Walk New Orleans enjoys a day of service at the KIPP Renaissance High School, one of the many charter schools that has popped up to support NOLA education since Hurricane Katrina. The idea for Random Walk New Orleans came from a lack of inclusivity in the programming, specifically with budget friendly options. We realized that the bonding experience created on Random Walk is unmatched for an incoming Boothie and it is important that there are options that suit all budgets. In addition, we wanted to create a RW experience that featured a community service activity to benefit the locals, as giving back is a part of the Booth community and was a priority for us as trip leaders. As leaders, we looked for U.S. cities that would allow us to both have a lot of fun and meet our trip goals. When considering all possible options, New Orleans stood out, because it is by far one of the most unique cities in the United States. The city has so much to offer with its history of French, Spanish and African culture, and it is home to some of the most unique cuisines. We knew that it would be a great fit for our trip! As our group came together on RW NOLA, we could tell it was going to be an amazing and unique experience. 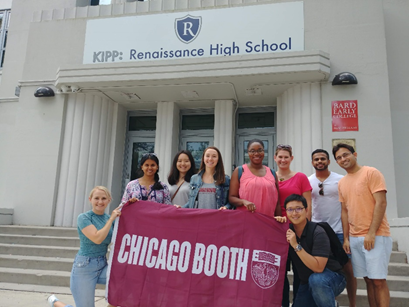 For example, our service at KIPP Renaissance High School was one of the most rewarding moments of the trip. In many ways, New Orleans continues to struggle long after Hurricane Katrina. The public-school system collapsed, and the city is now serviced by only charter and private schools. Because of these ongoing issues, we decided to do our community service project at KIPP Renaissance High School. We worked as a team to inventory books, organize over 700 shirts, and rearrange the school supplies closet to get the school ready for another year. The faculty was amazing and were excited to have our help as these tasks often get overlooked once the school year begins. From our interactions with the staff and students, we learned about their goals for the school year as well as about the day-to-day operations of one of New Orleans’ top charter schools. The impact of this time was not only to the immediate changes at the school, but also to our own understanding of charter schools in the U.S. In addition to this hard work, we, of course, found plenty of time to have fun, relax, and bond as the inaugural RW NOLA class! One of the biggest highlights of the trip was listening to jazz on Frenchman’s St. We also had the opportunity to sample some of New Orleans’ most famous foods, including chargrill oysters, beignets, po-boys, jambalaya, gumbo, and etouffee during our culinary tour where we learned about the difference between Cajun and Creole cooking. We even got to sample alligator and tortoise soup! Also, we enjoyed the architecture of the city, which holds years of history as many of the buildings have been repurposed but not remodeled. For example, many of the 18th century buildings in the French quarter still have carriage halls. In addition, we were able to participate in a bayou airboat tour, which was quite an adventure! Not only did we get to see alligators that are decades old, but we also got to hold a baby alligator named Fluffy. Luckily, Fluffy did not bite, which was only somewhat reassuring as we each took turns holding her. Overall, our trip was a great mix of fun, new experiences, making new friends, and giving back to the New Orleans community. As RW leaders, we believe all of these are necessary components for a RW. Exploring a new city and its culture is a great experience, but we think it is a disservice not to also take time to help the people and communities of these cities. There is so much to learn about a culture when visiting for the first time and little can be learned by going to tourist popular attractions. So much more can be learned by working with the locals and finding a way to give back to society, which is why Random Walks with a community service component are essential. Our hope is that all Random Walks will consider adding a community service activity in the future. For now, we look forward to seeing how the incoming Class of 2020 will carry on this tradition of a U.S.-based service trip! Puerto Rico anyone? ?